Simple surgical excision (removal) is the most common method used to treat both primary and recurrent skin cancer tumors. The procedure involves surgically removing the tumor and a certain amount of normal-appearing skin surrounding it. This surrounding region is called the "margin" or "surgical margin." Removing the margin maximizes the chance that all the cancerous cells will be removed. After the lesion is excised, it is sent to a pathologist who checks the margins of the excision to make sure they are clear. Excisions are used to treat both primary and recurrent tumors. For basal cell carcinoma (BCC) and squamous cell carcinoma (SCC), margins are usually 2 to 4 mm. This results in a cure rate of 95 percent and 92 percent for primary BCC and SCC, respectively. These cure rates are dependent upon the site, size, and pattern of the tumor. Excision may be performed in the outpatient or inpatient setting depending on the extent of cancer. BCC and SCC are referred to as nonmelanoma skin cancers and are the most common forms of skin cancer, with BCC being more common than SCC; as many as 75 percent of nonmelanoma skin cancers are BCC. Despite being the most common skin cancers, nonmelanoma skin cancers only account for 0.1 percent of cancer deaths. Stage 0: 0.5 cm margin. Stage I: 1 to 2 cm, depending on the thickness of the melanoma (called the Breslow thickness). Stage II: If the melanoma is 1 to 2 mm thick, a 1 to 2 cm margin of normal skin will be removed as well. If the tumor is 2 to 4 mm thick, at least 2 cm of normal skin will be removed from around the tumor site. If the tumor is more than 4 mm thick, a margin of 3 cm is recommended when anatomically possible. Stage III: 1 to 3 cm depending on the thickness of the tumor, followed by chemotherapy, immunotherapy, or other adjuvant treatments. 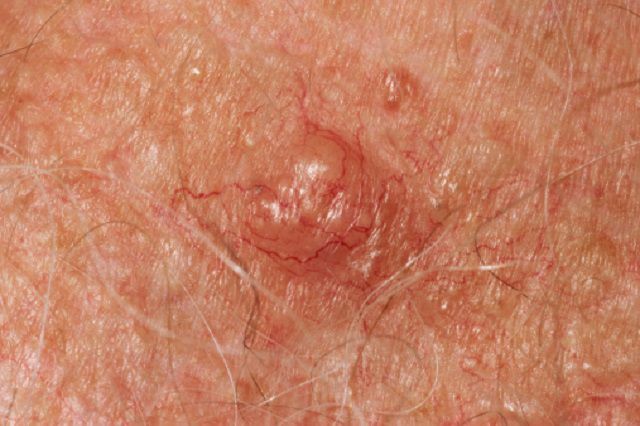 Basal cell carcinomas, or BCCs, are abnormal growths or lesions in the skin's basal cells, which appear in the deepest layer of the outer layer of skin. BCCs commonly appear as red patches, bumps, growths or open sores on the skin. They may also appear as scars. BCC can be disfiguring, but rarely metastasizes beyond the tumor, though it can occur. Suspected BCCs should be examined and treated, and should not be ignored. Squamous Cell Carcinomas, or SCCs, are abnormal growths in the skin cells of the uppermost layers of the skin. SCCs commonly appear as open sores, scaly red patches, warts or growths that have a depression in the center. These may bleed or develops scabs, and they can be disfiguring. Though they are among the most common skin cancers and account for a relatively low percentage of deaths from cancer, they can metastasize and should not be ignored.